Principal Armando Giglia with students Murtaza Mohammadi, Chloe |McCabe, Ryan Duncan, Sasha Phillips, David Brooke, Emma Michell, Sean Wills, science teacher Bryan Rodrigues, and seated, Solomon Camilleri-McDonald, Lily Smetherham and Charlotte Kaltenrieder. Science teacher Bryan Rodrigues said both international competitions tested critical thinking, problem-solving skills and science knowledge. Year 9 student David Brooke achieved a distinction in the Big Science Competition, while six other students gained credits. 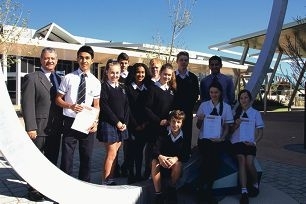 In the Australian National Chemistry Quiz, the school got one high distinction, seven distinctions and one credit. Murtaza Mohammadi ranked in the top 10 per cent of the state for Year 9 students.